Ghost II, the second hull in the Majesty 122 series has been delivered to her new owner in Australia, UAE-based builder Gulf Craft has announced. Featuring a striking jet black coloured hull, this 37.5 metre fast planing yacht was styled in-house by the Gulf Craft Design Studio. 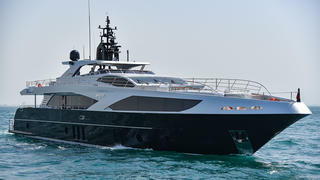 Built from a GRP hull and superstructure, Ghost II will now be made available as yacht for charter. Ghost II’s exterior design features extensive lounging and entertaining spaces, including an extended balcony and spacious flybridge, which are capable of hosting up to 120 people. Her superyacht garage was designed to take a jet ski and a five metre Castoldi tender. 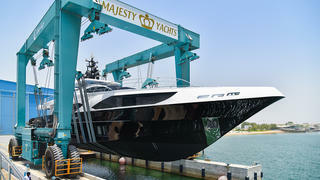 Her 7.6 metre beam allows for a total interior volume of 250 gross tonnes. Accommodation for 12 guests is split between a master suite and four guest cabins, including two pullman beds, two twin cabins and two double cabins. Power comes from a pair of 1,925hp CAT C32 ACERT diesel engines for a top speed of 24 knots. Built to RINA and LY3 standards, Ghost II will be based in Sydney and made available for charter on the East Coast of Australia. Ghost II follows on from the first hull in the Gulf Craft Majesty 122 series, Nashwan, which was launched in 2015 and won the Quality and Value Award at the 2016 World Superyacht Awards.